Food production that is on-spec is the critical first step for a best-in-class food contract manufacturer. Beyond that, delivery that is not only on time but also cost-effective is critical to customer satisfaction. With our experience and the ability to reduce supply chain costs, we at PacMoore deliver the best of both worlds. Shipping food products often requires special handling, such as temperature control or providing moisture-resistant packaging so food stays fresh and appealing. Food manufacturing and shipping of foods and ingredients are global, complex and highly regulated undertakings, but leveraging an efficient supply chain can help you save money, satisfy your customers and ensure that your reputation for quality food products stays intact. At PacMoore, contract manufacturing and shipping of dry food ingredients and finished goods are key parts of what we do, and our expertise in food manufacturing and shipping can help you reduce spoilage and control costs. Here’s how. Now that the blending, spray drying, extruding and packaging work is done, it’s time to send your finished ingredients on their way. Not only does PacMoore help you with your food production, we also prepare food products for shipping. Whether you need to ship by rail car, full truckload, LTL or overseas containers, we have the expertise in supply chain logistics to help you get the best deal for on-time deliveries. We make sure your products are treated with special care. We can add dunnage when needed to protect your ingredients from damage or spills, and we even offer floor loading to maximize space by stacking packages by hand. To eliminate mistakes, each of our facilities has dedicated shipping docks, dedicated shipping and receiving personnel, and rigorous protocols and reporting systems. Shipping can be a very paperwork-intensive process. There are bills of lading and shipping manifests, labeling requirements including special-handling labels, and in the case of international shipments, pro forma invoices and customs declarations. Even a single error or missed entry can delay your shipment, resulting in an unhappy customer and potentially spoiled or expired products. 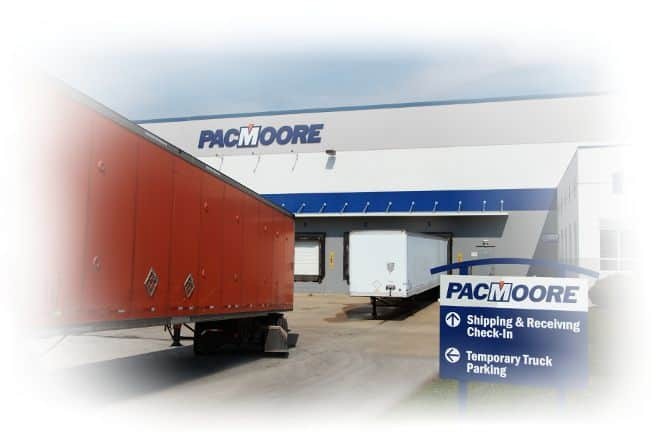 The PacMoore team has experience in all modes of shipment and with most major carriers, so we know exactly what needs to be done to ensure your shipment gets out the door and to your customer’s dock on time. The supply chain starts in the warehouse. Our efficient picking and packing teams carefully pick each order and double check everything for accuracy. We help you avoid the high cost of premium freight charges by ensuring shipments are properly bundled, and ready to go on time to reach the customer on the expected date without having to resort to expediting, overnight or air freight. We manage your logistics budget with the same care we devote to our own. In fact, we’ve published a list of tips to help you control your food production shipping costs. You probably know us as a contract food-manufacturing partner, but we also offer warehousing and supply chain services and shipping of dry food ingredients and finished goods. We have a dedicated customer service team who will personally coordinate your shipping needs to ensure timely delivery at the lowest possible cost. Our goal is to provide the best possible food manufacturing and shipping of dry food ingredients and finished goods so your supply chain becomes the key differentiator that you rely on to satisfy customers, control costs, reduce spoilage and comply with regulations. To find out more about how PacMoore can improve your supply chain performance and control overall food product supply chain costs, contact us today. Our shipping and receiving hours are from 8 a.m. to 4 p.m. Mondays through Fridays. Appointments are necessary except for LTL deliveries or pickups of fewer than nine pallets.